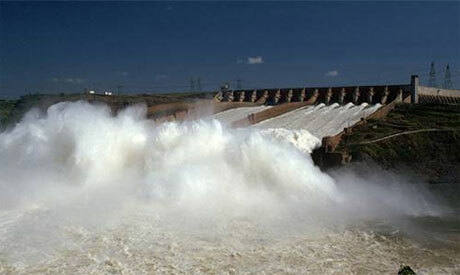 Ethiopia will start building a major dam along the Nile River to generate hydropower to increase electricity production, Prime Minister Meles Zenawi said late on Saturday. The Horn of Africa nation aims to produce 15 thousand megawatts of power within 10 years, part of a strategy that spends $12 bn over 25 years to improve the country's power-generating capabilities. "We are planning to carry out a number of important projects, including a major project on the Nile," Meles said at a press conference late on Saturday. "The project will soon be inaugurated," he said, referring to a dam Ethiopia intends to build in its western Benishangul region near the border with Sudan. According to the Ethiopian Electric Power Corporation's plan for the 2010/2011 budget year, the agency says the dam would generate 5 thousand MW upon completion in five to ten years. Outages have been common in Ethiopia for five years. The country rationed power for over five months last year with lights going off every second day, closing factories, hampering exports and fuelling a shortage of hard currency. Ethiopia is building five other hydropower dam projects, some funded by the World Bank. @ ali save the brotherhood talk for yourselves. too late to be friends. we were starving (when rain disappears) when Egypt kept on stirring violence in Ethiopia. now we are coming back and there is nothing u can do about it. Any project should not harm any country. This is the time to do the dam on the nile. it is not proposed to divid ethiopia or to make any riligios divisions but to develop the country to the next stage as well as to use the nile as much as possiple equally. Clearly Ahram Online is very liberal to allow a post as crude and illiterate as "Gragn Ahmed," an Eritrean voice claiming to be Ethiopian. PLEASE EGYPT MELES IS NOT OUR LEADER SO STOP HIM. HE TAKING THIS OPPORTUNITY TO DIVIDE OUR ETHIOPIA. HE BURNS MOSQUES AND HE ALSO TELLS HIS SECRET POLICE TO USE KURAN FOR TOILET. LATEL HE BURNT 10 MOSQUES AND IS TRYING TO USE WEST AGAINST EGYPT TO DESTROY OUR COUNTRY ETHIOPIA. WE WANT FRIENDLY RELATIONS WITH EGYPT BUT THIS MAN IS CRAZY TO GIVE US ANOTHER ILLEGAL DAM IN THE NILE. HE IS PROMOTING CHRISTIAN COPTS TO KILLS MUSLIMS OF ETHIOPIA. EGYPT ACT FAST TO STOP THIS MAD MAN.